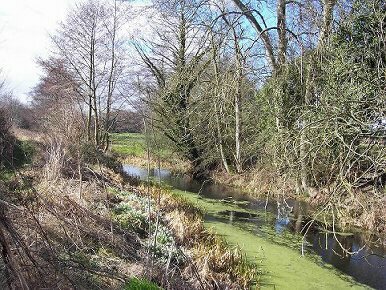 The Guilsfield Arm, which is in parts a nature reserve, branches off from the main line of the canal at a point just above the top lock at Burgedin. 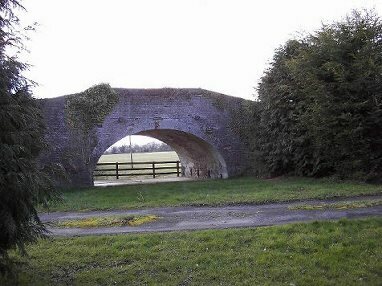 Believed to have been constructed around 1797, the two and a quarter mile long, level arm, terminated well short of the village of Guilsfield at Tyddyn where there was a basin, wharfs and Navigation Inn. 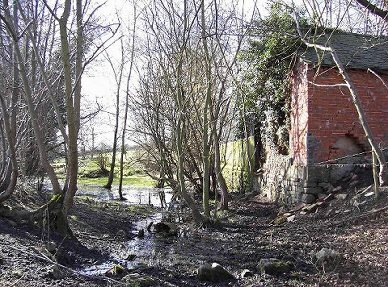 It was originally built to carry lime, lead and slate. Later, cargoes of coal were carried to Tyddyn where in 1828, a coal wharf was known to exist. 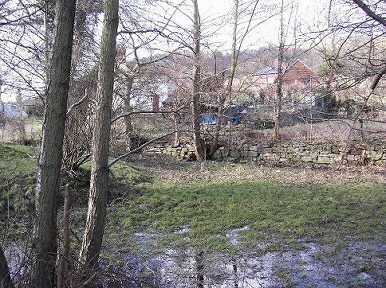 Whilst the towpath is walk-able in Winter time ( with some locked gates and barriers across the towpath), in spring and summer it gets so over grown it becomes fairly im-passable for all but the most determined walker. 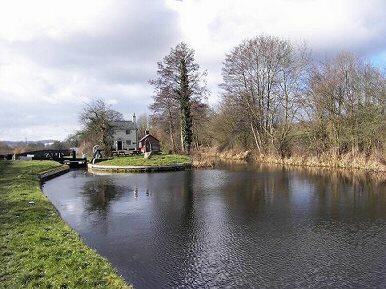 The Guilsfield Arm leaves the main line of the canal to the right of the Top Lock at Burgedin. The Burgedin Lock Cottage seen in the centre of the photo is now a British Waterways Office. Traveling along the arm you come to the first obstruction, a pipe crossing the canal. 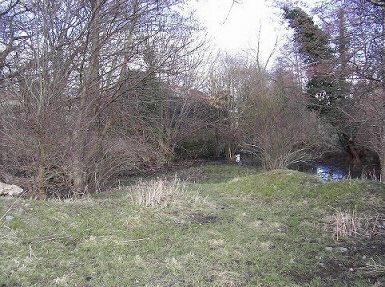 The canal then crosses the Guilsfield road. At this point it has been filled in and piped under the road. At the North side of the crossing, the pipe, having passed under the road, is seen to enter the channel. 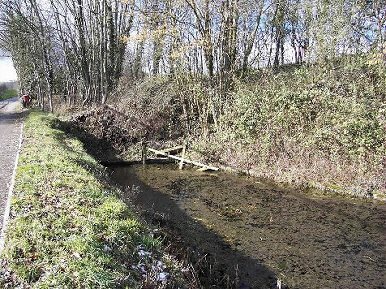 Leaving the blockage, the arm runs parallel to the road and clear patches of water are to be found. Passing The Hollies, the canal is choked by reeds but the towpath is quite useable for walking. 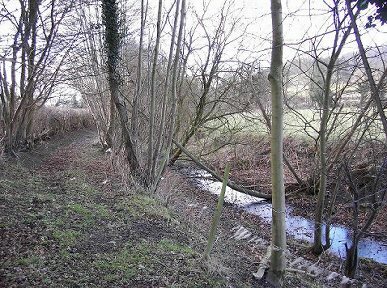 Approaching Deepcutting, clear water can once more be seen in the canal bed which has trees lining both banks. 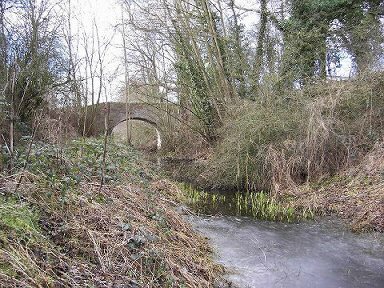 Bridge Number 2 at Deepcutting, carries a road over the cutting which is up to 20 feet deep and over 600 foot long. 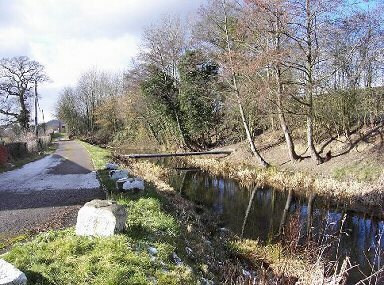 The far bank side is walk-able with care and takes you up above the canal. 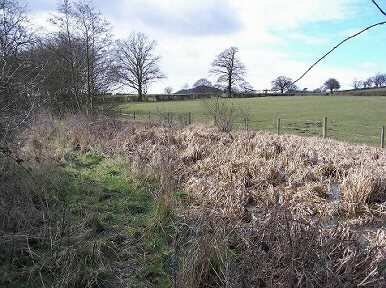 Near Burgedin Hall, the towpath is completely blocked by a hedge but water is still to be seen in the canal bed. 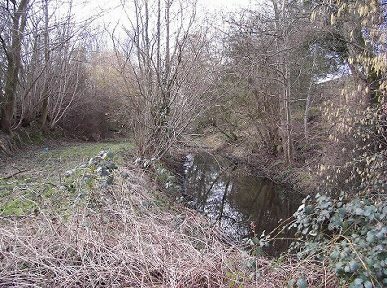 Nearer to “Bridge”, the canal bed has become shallow with little or no water in it and is lined by trees growing on the towpath side. The next bridge (No. 4) that you come to, has been concreted underneath and a driveway has been constructed across the bed of the canal. At “Bridge”. 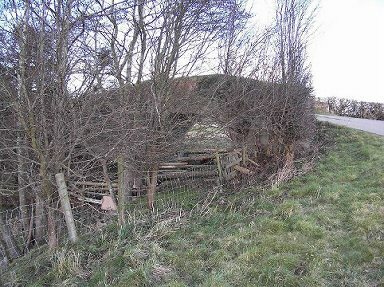 Bridge 5, partially obscured by trees, passes over another section of dry canal. 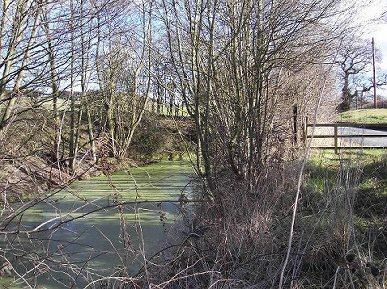 Between “Bridge” and Tyddyn, shallow water marks the channel but the towpath is quite passable. 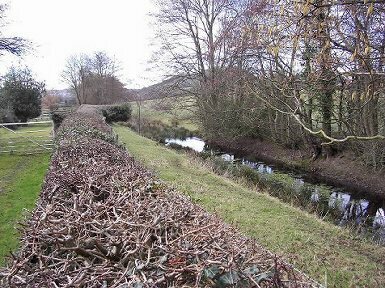 Also between “Bridge” and Tyddyn, a section of the canal bed has stone sides. 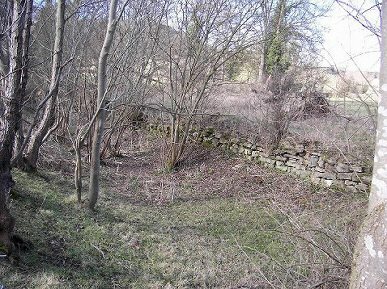 This may have been a wharf area for the limekilns at Varchoel. 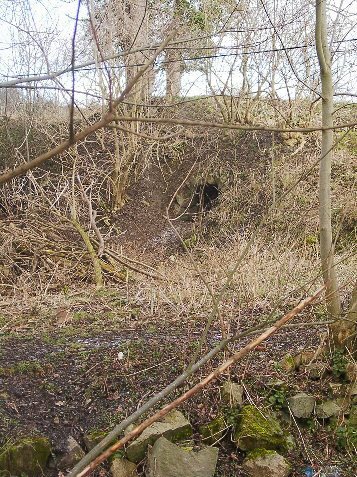 This photo (courtesy, Sue Perry) shows what remains of one of the lime kilns at Varchoel mentioned in the previous photo. Unless you are aware of it, it is quite easy to miss. At Tyddyn, the building seen to the right of the photo was one of two wharf buildings. 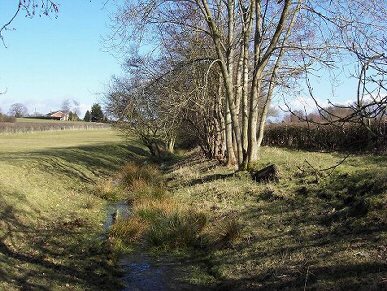 This area , now with trees growing in it was Tyddyn Basin, the terminus of the Guilsfield Arm. View across Tyddyn Basin looking north. The building that you can see were the wharf cottage and behind it the Navigation Inn, now private houses. Tyddyn Basin seen from the field that was used to graze the horses that pulled the boats. 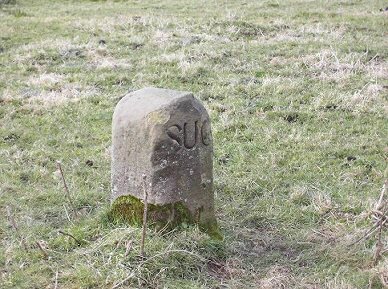 In the field adjacent to Tyddyn Basin, is evidence of the Shropshire Union Canal Company ownership. Stone pillars used to tether the canals horses after arriving at the wharfs.